My fig tree is about 20 years old. 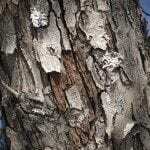 There are orange, crusty blotches on three sections of the tree around branch shoots. I sprayed some Daconil fungicide on it in November, but to no effect. This is a Honey fig variety. I live in Vancouver, WA.